Description: Offering space and tranquillity, this Grande design home sits high above the banks of the Clarence River and provides uninterrupted river and mountain views from its well set out balconies and entertainment areas. 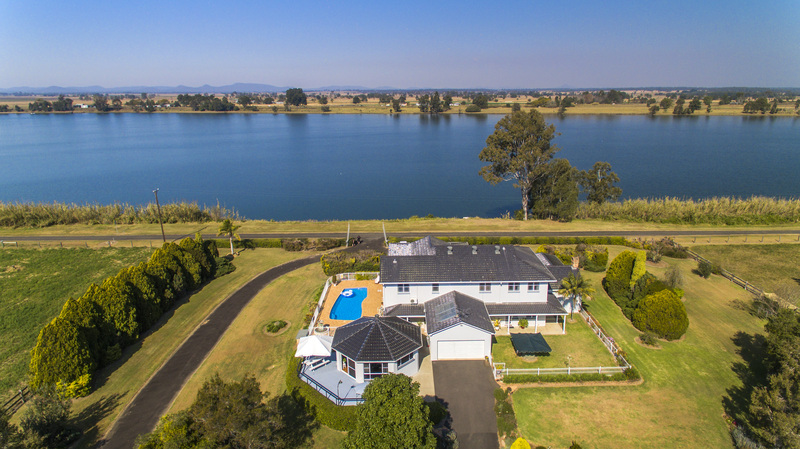 This is a unique opportunity to purchase one of the most spectacular riverside mansions on the beautiful Clarence Valley, and begin living the lifestyle others only dream of. Zoned RU1 Primary Production this brings an exciting opportunity to earn income from Environmental protection works, extensive agriculture, forestry, intensive livestock and plant agriculture, animal boarding and training establishment, rural industries and much more with the 106 acres on offer. Not only can the land bring in potential income, there are other business opportunities this home could offer such as, bed and breakfast accommodation, community facilities, recreation areas for hire, or an amazing wedding venue capable of catering for ceremonies, receptions and even guest accommodation (subject to council approvals). With an additional stockman's quarters, consisting of four bedrooms, kitchen and bathroom, plus a one-bedroom granny flat or workers lodge, this astounding property can sleep endless numbers of guests. The perfect home for the extended family, extra income or housing farm maintenance or ground keeping staff. This impressive six-bedroom home offers everything a growing family needs and more. The radiant master bedroom boasts a walk-in robe, ensuite and private deck boasting serene river and rural views. Four king sized bedrooms have built-in robes and natural sun light, whilst the sixth bedroom on the ground floor is currently used as a large office leaving no shortage of space and comfort for the growing family. With luxury in mind, the expansive open-plan living and lounge area showcases direct river views and feature cathedral ceilings, a handmade Italian crystal chandelier, large open fireplace and an Australian handmade cedar bar which turns this area into an entertainer's delight. The large open plan kitchen consists of American oak timber and Blue Pearl Granite bench tops, Chef cooktop, Miele oven, microwave and dishwasher. With an extra-large island bench and a formal dining area there is ample space for large family dinners and gatherings. An external octagonal room was built with entertainment in mind boasting local hardwood, polished timber flooring, timber ceiling, air conditioning and a fully equipped kitchen with gas cooking. Surrounded by rural and river views, this entertaining area includes its very own 60m2 open deck with timber seating and a 4m umbrella overlooking the 11m saltwater in-ground pool. Easy to see why the current owners spend most of their downtime in this zone. A truly amazing 42.95 hectare (106 acres) riverfront mansion boasting highly productive alluvial soil that will fatten cattle, and is well equipped for farming, cropping, macadamia trees and various livestock. The Grandeur rural escape comes with quality stockyards, cattle crush and head bails, loading ramp and electric scales, lighting and a secondary set of stock yards. Water is plentiful with town and tank water, plus a dam and bore. There are six paddocks all with town water, underground electricity and a co-generation solar system. Enjoy your own fruit trees and vegetable gardens, a large chicken coup and a fenced court-yard for the children or pets. All aspects of the home compliment this impressive rural property which holds pride of place in this stunning location. This home is offered with most of the furnishings and Antiques within. Noted Inclusions:- Farming equipment; dishwasher; reverse cycle air-conditioning; ceiling fans; fireplace; ducted electron vacuum system; solar power system and solar hot water and is secured with a full security alarm system and internal intercom radio. Contact Vision Property Sales Today!!! Email Vision Property Sales Now!